Patient focused, community oriented, conveniently located and equipped with technology that rivals the nation’s most prestigious healthcare systems, Mountainside Medical Center offers a comprehensive and growing array of services delivered by caring and highly skilled medical professionals. We’re proud of the therapeutic and administrative upgrades we have made. We’re the convenient, friendly community hospital that delivers the quality care, medical excellence and technology on which you can depend. 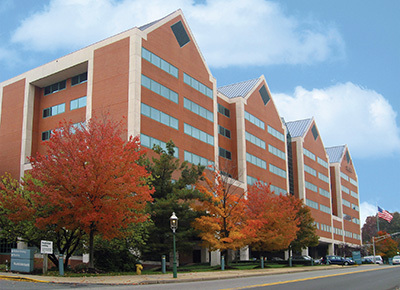 Mountainside Medical Center has been serving Montclair and its surrounding New Jersey communities since 1891. The physicians, nurses and volunteers who are a part of the Mountainside family are also your friends and neighbors. We're your community, your hospital and your team, working hard on your behalf. Never content with the status quo, we continue to add services, staff, programs and technology to benefit our patients and our communities. From our state-of-the-art emergency center with its Fast Track program to our holistic mind-body women's program to our comprehensive cancer center and a weight-loss surgery program recognized nationally as a Center of Excellence, Mountainside Medical Center is the right choice in the greater Montclair area. Margaret Jane Merewether Power was a preacher’s daughter who came from England to Montclair in 1874 with her husband. One summer day in 1890 she encountered a child who had fallen from a third-story window. Upset that there was no nearby healthcare facility where the child could be helped, she called on other women in her social circle to find a solution – marking the birth of Mountainside Medical Center. By 1891, a three-story cottage belonging to widow Eliza Sheridan had been purchased. Dr. John J.H. Love was named the first President of the Medical and Surgical Staff, and Mountainside Medical Center officially began its mission of “caring for, curing and nurturing the sick and injured.” Today, nearly 130 years later, Mountainside Medical Center is still carrying out that mission. With 365 beds and 820,000 square feet in total, Mountainside Medical Center has come a long way. But some things never change. The compassion and commitment to the community felt by Mrs. Power continues to this day. Located in on the border of Montclair and Glen Ridge, Hackensack Meridian Health Mountainside Medical Center is proud to continue to provide world-class health care in a community setting. The medical center has successfully transitioned from a stand-alone facility to being part of Hackensack Meridian Health, the most comprehensive and truly integrated network in the state of New Jersey. The medical center is a joint venture between Hackensack Meridian Health and Ardent Health Services, one of the country’s leading private hospital management companies. The following documents represent Mountainside Medical Center's annual audited financial statements for the year ended December 31, 2016 and the latest quarterly unaudited financial statements. These financial statements are posted in compliance with the New Jersey Department of Health's request for transparency of hospital financial conditions and performance, and are not intended to be, nor should they be, relied upon by any third party for any purpose without the express prior written acknowledgement of Mountainside Medical Center. Meet our heroes and why they make a difference in building organizational reliability and performance.